Interactive lesson teaches math concepts. Is there a better alternative to Smooth Operators? Is Smooth Operators really the best app in Mathematics category? Will Smooth Operators work good on macOS 10.13.4? 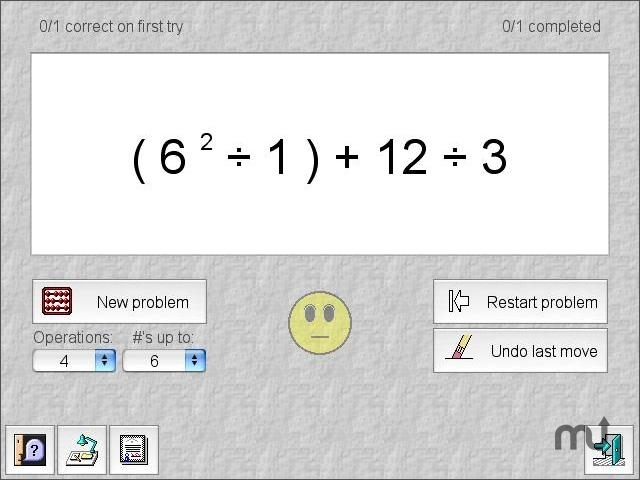 Smooth Operators is a complete solution for learning, practicing, and testing the order of operations. An interactive lesson teaches the math concepts thoroughly with explanations and example problems, including an optional section on exponents. Memory aids are introduced, but users also learn a logical approach to the order of operations. In practice mode, students click on operators in the correct order. In test mode, the user types in the correct answers. The number of operations per problem and the size of operands can be adjusted. Score is always displayed. Smooth Operators needs a review. Be the first to review this app and get the discussion started! Smooth Operators needs a rating. Be the first to rate this app and get the discussion started! Smooth Operators helps students master crucial skills and take the first step to preparing for algebra and higher math, while providing ample opportunity for arithmetic practice.